Early voting tallies show Montgomery increased turnout by only 1% compared to the 2010 gubernatorial election, and that is with roughly 60,000 more eligible voters added to the rolls. Montgomery is far below the statewide average of 8.3% and had the third lowest turnout in the state. Many believe overall turnout will be affected by lackluster local races, where the races for county executive, state Senate, House of Delegates and County Council are largely decided. With three days remaining before Election Day, the Brown campaign has set its sights on two legislative districts in the eastern corridor of the county. District 20, the Takoma Park-Silver Spring area which has a high concentration of Hispanic voters and considered the most liberal district in the state, and District 14, which covers Burtonsville, Olney and Damascus, where many Republicans reside. A personal email sent out by the founder of Safe Silver Spring, a non-profit safety advocacy organization, urged supporters to join the Brown Campaign in canvassing Saturday and Sunday. “We have over 8,000 people out across the state talking to voters, of course we have a huge presence in Montgomery County,” said Brown Campaign Manager Justin Schall. The campaign has two offices and paid staff in Montgomery County, but candidates for lower office report little coordination with their own campaigns. Sen. Karen Montgomery, D, the Dist. 14 incumbent, was not endorsed by the Washington Post for the seat, and Republicans have campaigned heavily there. GOP volunteers have knocked on over 1,200 doors in Olney and participated in three parades in the district, said Kat O’Connor, spokeswoman for the Montgomery County Republican Central Committee. Hogan also joined volunteers for the Burtonsville parade. On Thursday, Hogan’s campaign released internal polling showing Hogan ahead by five points in the gubernatorial contest. Late Friday, the Cook Political Report moved the governor’s race to “toss up,” but Saturday morning, Nate Silver of FiveThirtyEight, a nationally acclaimed polling statistician, predicted Brown would win by 9.7%. Hogan spent Friday morning at the Silver Diner in Rockville. Saturday morning he visited the Rockville Farmers Market where several voters said they were still undecided, despite the fact the general election is next Tuesday. Greenberg’s friend, Sylvia Jones, 62, also a Democrat said she too was undecided. Samantha Khotsombath, a 39-year-old mother of two, said she is still undecided but will get up to speed on the candidates in the next couple of days. “I’m busy, but I’m an active voter,” said Khotsombath, a registered Independent. Early voting analysis chart by David Lublin on Seventh State blog. 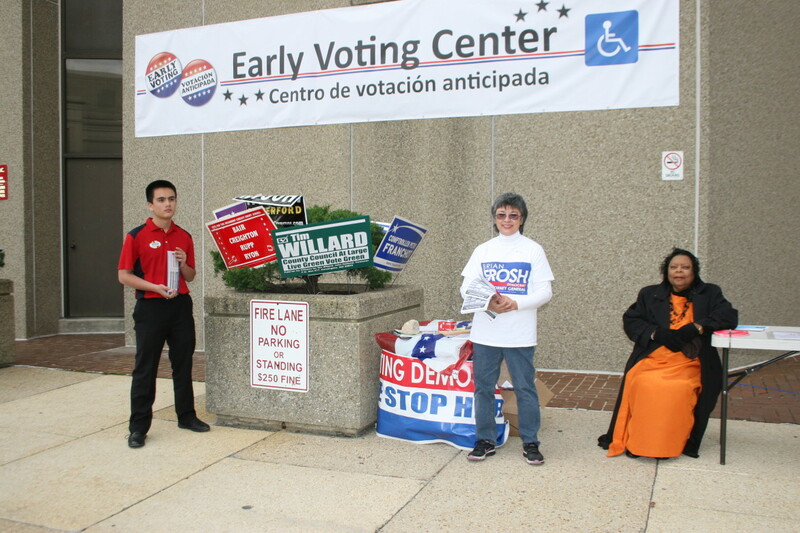 David Lublin, American University political science professor and former mayor of Chevy Chase, has been reporting on early voter returns on his blog Seventh State. Compared to early voting figures in 2010, the last gubernatorial election, statewide Republicans increased their early voting percentage by 49% compared to 35% for Democrats and 55% for Independents. Lublin believes Democrats didn’t take full advantage of the expanded early voting centers in Montgomery. Despite the momentum Hogan is enjoying in the runup to the finish line, it is hard to believe that he will overcome the Democratic dominance in Maryland. A Democratic strategist familiar with the campaigns of Attorney General Doug Gansler and Del. Heather Mizeur report there was little effort to recruit them after their preferred candidates lost. Brown easily beat Gansler and Mizeur in their home county, but the two opponents together got more votes than Brown. Both Gansler and Mizeur have officially endorsed Brown, but they have not been involved in his campaign. Mizeur this week wrote that her advice and views had been rejected by the Brown campaign. There still are many Democrats who still don’t quite get Brown. “I think all his supporters wish he were better at communicating his positions with voters,” said Holly Joseph, chair of the Montgomery County chapter of the National Organization of Women PAC. Joseph said many people feel like they’ve never gotten to known Brown over the course of the campaign, unlike other gubernatorial candidates, including Gov. Martin O’Malley. She gave an example that as soon as an event is over, Brown is swept into his vehicle without talking to anyone. “I’m totally baffled by the whole thing,” said a frustrated Joseph. She said she asked Brown’s running mate Ken Ulman in early October why the campaign was faring so poorly with women, and Ulman was taken aback. In the weeks and months leading up to Election Day, the Republicans and Democrats have had a significantly different strategy for reaching out to voters. Taking advantage of holding every elected office in Montgomery, high level elected politicians such as U.S. Sen. Ben Cardin, Rep. Chris Van Hollen, County Executive Ike Leggett and Montgomery County Council President Craig Rice have joined Brown and his supporters at early voting rallies and get out the vote events throughout the county. New Jersey Governor Chris Christie will join Hogan for a fourth visit, and on Monday, First Lady Michelle Obama will rally with Brown in Baltimore. Democrats are still trying to figure out why they lost the gubernatorial election. Naturally, this process will continue for some time. But Democrats might as well begin by dispensing with some of the popular but unhelpful myths floating around.